We have made a collection of free bird house plans for general and species-specific nest box plans for you to use to build your own bird houses. 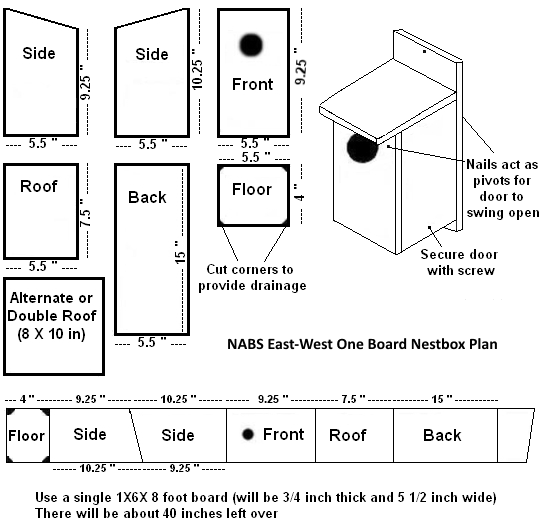 Here are bluebird nest box plans (pdf) that are fairly simple, you make all your cuts out of one 1"x6"x4' board. The plans can be used to attract either Western or Eastern Bluebirds. If you live in an especially hot climate, like the South, here are cooling bluebird house plans designed to draw air in and keep nestlings cool on hot days. We aslo have more information and plans on our bluebird house plans and Eastern Bluebird pages. Very similar to bluebird houses, the wren house plans are also made from one 1"x6"x4' board. Mounting location will be different as well as hole diameter size. You can read more by following the link above. As you may already know, when building a bird house for Purple Martins, you are not building for one pair, but rather for several to many pairs of birds because Purple Martins are colony nesters. You are essentially building an apartment complex that consists of several units or rooms for each pair of birds. You can also use gourds that are hung together instead of building a house. Here are purple martin plans for 1-level, 8 rooms (pdf file). We have additional information on our purple martin bird house plans and gourd birdhouses pages. Robins, phoebes and barn swallows are not cavity nesters so instead of a closed-in house, they rather prefer to nest on shelf or platforms with the front being completely open. They can be 4-sided, with a floor, 2 walls and a roof or if you have a sheltered area, like under an eave or porch, you can just build an open platform with no walls or roof. Here are robin nest shelf plans made easily from one 1"x10"x4' board. More free plans can be found at Phoebe and Robin nest box plans. A quick reference guide of bird house dimensions for 34 species including chickadees, swallows, hawks, owls, wrens, nuthatches and more. 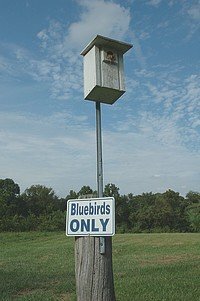 General information and tips when building a bird house. Best wooden bird houses rated by ease of maintenance and durability. Step-by-step instructions for how to build a bird house by hollowing out a tree log. Great for cavity nesters. A winter bird roost provides a sheltered house for birds to get out of the cold weather during the winter. More information about bird house designs. Kestrel bird house design and info about building materials and placement tips. Bird house hole restrictor to prevent squirrels from chewing the entrance hole larger.